Johanna Gencarella, left of Greenwich, and Peggy Rabut of Westport shop for fresh strawberries on the opening day of the Westport Farmers Market on Thursday, May 27, 2010. Eager shoppers, many carrying their own recyclable bags, turned out in record numbers Thursday for the first day of a new season at the Westport Farmers Market. An estimated 1,000 people tasted samples, ordered lunch from several fresh food purveyors and filled their bags with pungent herbs, organic strawberries, hydroponic lettuce, baked goods, honey, cheese, meat and seafood from about 30 vendors at the market, which is set up weekly in an Imperial Avenue parking lot. Visitors learned about raising chickens in a residential neighborhood from Judy Morris of Coop D'Etat in Weston; how to make blueberry-infused red wine vinegar from Bill Rizzuto of Rizzuto's Wood-Fired Kitchen and Bar in Westport, and how to grow heirloom tomatoes from Richard Moore of Moorefield Herb Farm in Shelton. People's appreciation of locally grown and organic foods is increasing each year, said Moore, who sells 35 varieties of heirloom tomatoes and 300 different varieties of herbs. "I'm so glad people are coming to the market more and more every year, and recognizing the importance of eating wholesome foods. I'm devoted. I eat organic food. I'm a vegetarian. 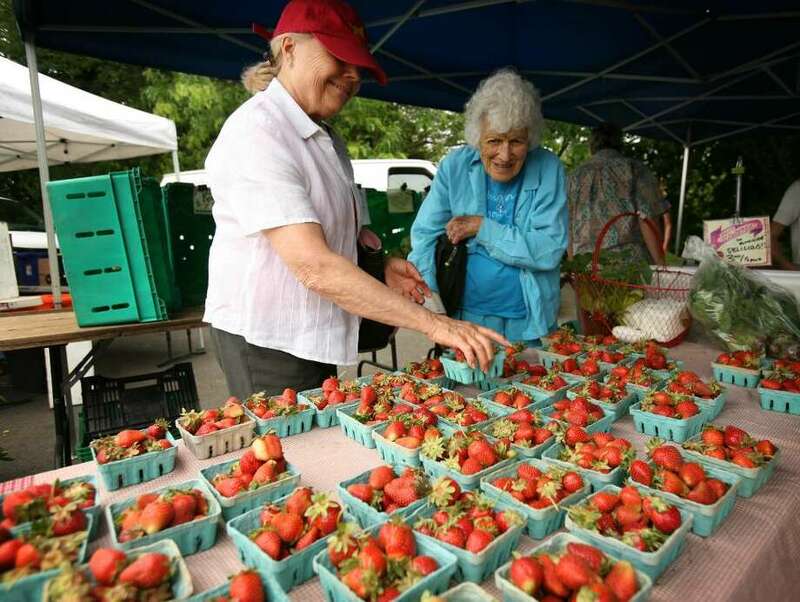 I'm 94 and I want to keep enjoying life," said Peggy Rabut, a Westport resident who purchased honey, free-range eggs, strawberries, two tomato plants and sprouts, the latter from Two Guys from Woodbridge -- which is really one guy from Hamden. Perry Hack grows a variety of greens and other vegetables hydroponically. Dianne and Allen Despres of Norwalk said they have been waiting all winter for the farmers market to re-open. "We saw the signs go up for it and I got excited. I put it on my calendar as soon as I got home," said Dianne Despres, who bought tomato plants. "So often you get tomatoes from the grocery store and they're awful," she said. Josh Moritz of Westport got lunch at the market and picked up clams from Westport Aquaculture for dinner. "I love grilling them," he said. As Louis Rybar of Trumbull strolled through the parking lot he tasted many free samples offered by vendors. "It's a real mix of flavors," he said. "It was a great day," said Janice McNamara, who works for Boxcar Cantina in Greenwich, which serves locally grown foods. "I was sold out by 11:30. This was a very busy day for opening day," she said. Rebecca Howe, who identified herself as "the fairy godmother" of the Westport Farmers Market, said the community has embraced it, prompting it to grow each year. This year there are about 10 more vendors than last year, according to Market Manager Lori Cochran Dougall, including Skinny Pines wood-fired pizza, Sugar and Olives and Raus Coffee. Also new this year, Howe said, are "Friends of the Market" buttons. The $25 purchase identifies the wearer as a supporter of the market and vendors thank them with discounts on their purchases or with a free item. "It's a way for the community to make the market self-sustaining and to be rewarded for their support," Howe said. There are other new additions to this season's market. Each week a different artist will display and sell their work, and a different chef will offer helpful hints for preparing fresh food. This week, Bill Rizzuto let shoppers taste his blueberry vinaigrette over an endive salad with fresh greens, plump blueberries, French green beans and grilled shrimp. "A little bitterness, a little sweetness, a little crunchiness; a contrast in tastes and textures," Rizzuto said. Another new element allows shoppers to learn about non-profit organizations, a new one each week. Howe said the market also will maintain an ongoing relationship with the opening week's non-profit -- the Bridgeport Rescue Mission, a homeless shelter in downtown Bridgeport that also prepares and distributes thousands of meals each month. At the conclusion of each week's market vendors will donate their surplus produce and other fresh foods to the mission. "We're trying to make the homeless a little healthier," said Chef Paul Byron, the food service manager for the Bridgeport Rescue Mission. Byron said eating healthy foods makes it easier to fight off a cold or the effects of depression. The Westport Farmers Market is one of more than 100 farmers markets that now take place across the state seven days a week. Most conclude in the fall but several continue year round. The Westport Farmers Market is open every Thursday through Nov. 18, 10 a.m. to 2 p.m.